Battlecry: Choose a friendly minion. Gain a copy of its Deathrattle. Still hunting for the ones who earthed him. For 3 3/4, awesome battlecry and cute art. Maybe this has been asked but out of curiosity, what happens if you copy the deathrattle from Ancestral Spirit? The enchantment from Ancestral Spirit says "Deathrattle: Resummon this minion." So does it summon what you put the Spirit on or does it summon a new Raptor? How does unearthed raptor work with brann bronzebeard? When he dies does the deathrattle trigger twice? It copies deathrattle effect twice. Hence when it dies, it is triggered twice. Priest: Well My 3 drop gives 3 health to a minion when it dies. Warior: Mine has taunt and is a beast for some reason. Rogue: Mine makes Piloted Shredder, Dr. Boom, and Sylvanas Windrunner more useful, and lets me get 7/8 for 3 mana if i get a Nerubian Egg ;). Warior: :) Its ok I still got my monkey for arena. Paladin: it's ok, my 3 drop makes people follow the rules. I like rules. Rogue should be : My 3-drop is completely dependant on other minions if not it's just a 3/4 vanilla. I am suuuper late for this, but I think the real mage 3-drop serves the Firelord and clears the enemy board with the help of The Coin and some Arcane Missiles on turn 3.
this is my new favorite card! When used with anubarak, does it return a raptor to hand? 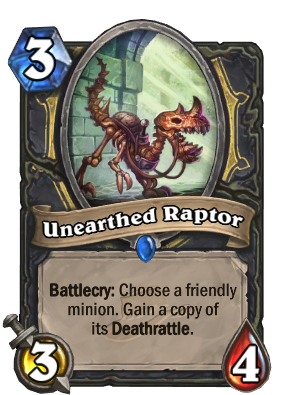 When the Unearthed Raptor goes back to your hand, does it still have Anub'arak's deathrattle?